← Transition: How do you start? What’s your take on social media? Earlier today I experienced social media deja vu for the first time. Who knew? A friend tagged a Forbes.com post on LinkedIn entitled,“The Six Enemies of Greatness (and Happiness)” by blogger Jessica Hagy. The caption included a few little drawings. The drawings looked and felt like the illustrations that I’d been seeing all week in “The Fifth Discipline: The Art & Practice of The Learning Organization by Peter Senge.” What can I say, the drawings spoke to me…. Hagy relates six simple conditions that cause us to adjust (READ: downward) our ambitions: availability, ignorance, committees, comfort, momentum, and passivity. It will take you thirty seconds to read. Very worthwhile. For those adventurous among us..there is a poll. Don’t worry, no registration required! “System dynamics is a method for understanding the dynamic behavior of complex systems. The basis of the method is the recognition that the structure of any system — the many circular, interlocking, sometimes time-delayed relationships among its components — is often just as important in determining its behavior (and outcomes) as the individual components themselves.” Sound confusing? Think of your world: a new job, a new school for your kids, an unexpected loss of a spouse’s or partner’s job, a mortgage payment due. Does the combination of all these factors ever feel like they have a life of their own? That’s Senge’s point. Understand the role of mental models: Mental models are introduced as “deeply ingrained assumptions or generalizations, even pictures, that influence how we understand the world and how we take action.” (Fifth Discipline, pg 8) One morning my 8 year-old daughter turned exasperated to me and said, “can’t you get a real job?” This plea revealed her very real desire to fit in with her peers and their ‘real job’ moms. My fascination came from how early a mental model of work ‘appropriateness’ had set in. 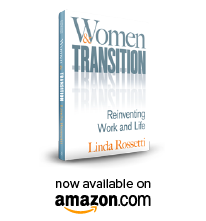 Does our notion of work, or success, limit our thinking of what’s possible in transition? My guess is that the answer is yes…. Is there alignment in your world? : Senge uses a jazz ensemble when introducing the concept of alignment. He states that great jazz ensembles ‘play as one.’ (Fifth Discipline, pg 235) To me alignment is so much more useful in thinking about the demands of our lives than balance. I remember my former boss offering his enlightened view of flexibility with, “you can work any sixty hours you’d like.” Am I the only one entertained by his view of work life balance? Can you articulate your purpose story? : Senge focuses on story telling as a critical element of leadership within a dynamic system. From his perspective leadership is embodied in the person who can articulate a purpose story, the larger story as to why it makes sense to proceed. “The purpose story is both personal and universal…a larger landscape upon which goals and dreams stand out as landmarks on a longer journey.” (Fifth Discipline, pg 346) Novofemina has explored story telling as a critical tool – I like the added flavor of a purpose. Would I get your purpose from the stories you tell? I’m really not doing Senge justice in the above. He advocates for the use of computer simulations to understand the behaviors that arise from dynamic, complex systems. He offers countless quirky diagrams. My take on transition today is that I am going for that “shockingly rare” space on the Venn Diagram (see above cartoon). I’ve made huge progress in designing a professional self that is headed in that direction. BUT, I constantly need reinforcement to beat back the mental models that tell me this work isn’t……isn’t worthwhile, isn’t valued, isn’t realistic. William Bridges author of Transition Making Sense of Life’s Changes would be proud in that I’ve traversed the ‘endings’ part of the transition process with full gusto. I’ve broken “the connection with the setting in which we have come to know ourselves.” He just forgot to mention the filters and mental models we need to scale in embracing the ‘beginnings’ side…. This entry was posted in Observations on Transition and tagged career transition, career transition issues, Fifth Discipline, Jessica Hagy, MIT, novofemina, observations from a women's transition, personal transition, Peter Senge, transition, Transitions Making Sense of LIfe's Changes, William Bridges, women's professional transition, women's transition issues, work family balance. Bookmark the permalink.